Yes, I know Christmas is not even close yet (even though I can smell it already) and we sort of have to wait until after Thanksgiving Day to even start thinking about it. But! I can’t wait that long to share with you these awesome and practical ways for you to start saving money on Christmas presents. I have to confess that I start thinking about everything that has to do with Christmas the minute Halloween is over. I love Christmas, the carols, the movies, the decorations and how happy everyone seems to always be. On the other hand, I do not like to shop around Christmas time because it can get crazy out there and I just don’t have the time to fight over the last toy on the shelf that my daughter really wanted, you know what I mean? That’s why I love to start planning and making a list of the things that I need to buy. I set out a game plan with my hubby as to what presents we are buying our kids and then we go from there. This year we have planned on buying Christmas presents right now, this month because that way it will save us a lot of stress and money. Did you know that the dollar spot in Target has great items that can make a perfect present? Yes! You can buy a few items and then make a cute gift basket out of it, I’m sure you will make someone happy with that. The Dollar Tree also has a lot of great things that you can buy for one dollar, like hello! You do not need to spend a lot of money on presents, you can buy here and there and then create the perfect gift basket for someone special in your life. Let me tell you that I bought a few kitchen Christmas decorations at the Dollar Tree that I’m really excited to use. You don’t have to only give the gift basket as a Christmas present, you can purchase one big item that your child really wants and then for an extra gift you can give them a super fun but inexpensive gift basket. Buying Christmas presents right now will save you money and stress. Wouldn’t it be great if you set aside a few days of this month to buy a few if not all of the Christmas presents? You will not be stressing out that you don’t have money or that the toy you wanted to buy is sold out in stores and online (a mother’s worst Christmas nightmare). Purchasing in small amounts this month will help you think better and follow through with your budget because you are not rushed to buying just anything. I also think that everything is more expensive when Christmas eve is approaching, don’t you think? Here’s a simple and yet effective tip to save money while shopping for toys, don’t buy the latest and newest toy that came out to the market because it will be expensive. Instead buy something that your kids wanted last Christmas but you couldn’t get, I bet you’ll find it for less this time around. Do your research of what stores you want to buy from and make sure that they have the items that you are looking for. Plan what time you are going to go and have a plan with whoever you are going with, divide the items and shop! Be careful, that’s all that I ask of you to do. Okay, this is more like it. I love shopping online and if you’re like me, then take advantage of all of the Cyber Monday deals. Cyber Monday happens on the Monday following Thanksgiving day, so write it down on your planner or set an alarm to remind you to shop till you drop out of the comfort of your home. 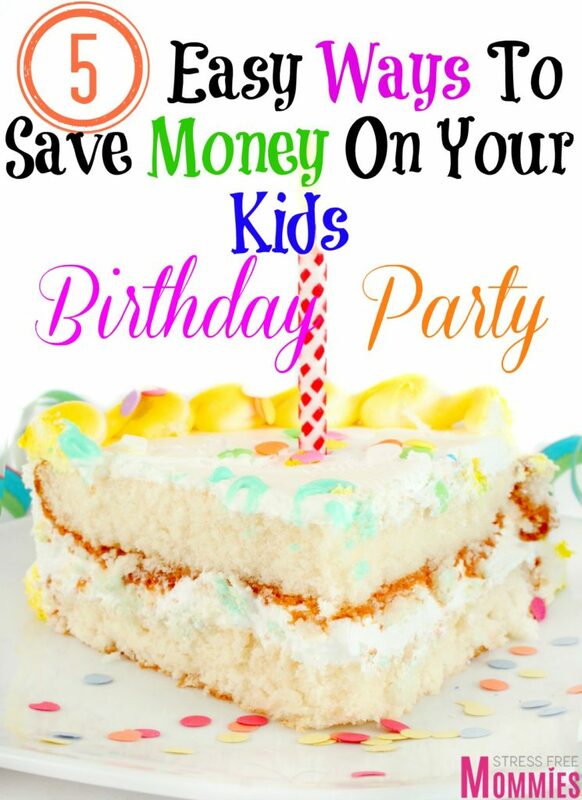 I have found so many great deals on kids clothing on Gymboree, Crazy 8, Carter’s and The Children’s place to name a few. You can also shop at Macy’s, Victoria’s secret and many more online stores. Please have a budget on how much you will spend while online shopping because you can easily loose count and go a little crazy shopping. It’s addicting because you see all these great sales and you think it’s okay to just buy and buy. It’s always a good idea to give yourself a limit because you do not want to overbuy because then you will overspend. I believe in making a list for everything because it helps me keep focus and be in control of what I have to buy and not what I want to buy. Write down a list of all of the things that you need to buy and then cross it out once you have purchased it. Follow through and you will save money because you are not just grabbing anything in the store, you have your list and the cost of each item. Follow through. 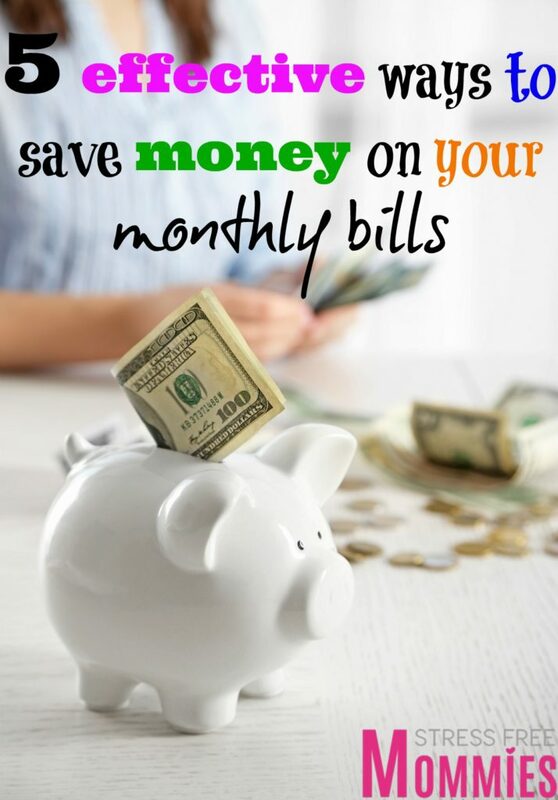 You have to stick to your budget if you want to save money and not overspend. This will help you hold yourself accountable to not spend more than your budget and to just focus on the items that you need to buy. Of course, set a realistic budget because if your budget is too low then you will obviously not stick to it. I always recommend this to anyone and that is to take cash with you instead of your credit card. It’s so much easier to swipe your card when purchasing something than using cash. You can take it even farther and just take hundred dollar bills, let’s see how long it will take for you to break your last one hundred dollar bill. I always think twice about any toy that I’m buying because I don’t want to break my last bill, haha! I love to shop on the sale rack of stores because you can find so many great things. Take a look at the sale sign next time you go shopping, can you find great items that will make a great Christmas present? I bet you can! Also, when you are shopping online, click on that “sale” option and start finding so many great and very cheap items like clothes and shoes. Are you ready to start saving money on Christmas presents? I know I am and I hope you can join me because we all know how hectic it gets during the holiday season, so start early and save your sanity. 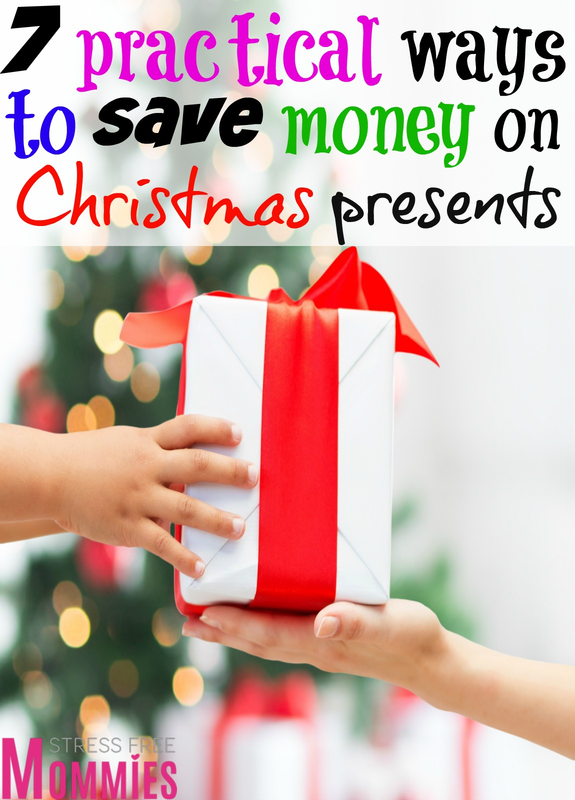 Do you have more practical ways to save money on Christmas presents? Sí, sé que la Navidad ni siquiera está cerca (aunque puedo olerlo ya) y tenemos que esperar hasta después del Día de Acción de Gracias para empezar a pensar en el ¡Pero! No puedo esperar tanto tiempo para compartir con ustedes estas maneras impresionantes y prácticas para que usted comience a ahorrar dinero en regalos de Navidad. Tengo que confesar que empiezo a pensar en todo lo que tiene que ver con la Navidad en el momento en que Halloween se termina. Me encanta la Navidad, las canciones, las películas, las decoraciones y lo feliz que todo el mundo parece estar siempre. Por otro lado, no me gusta comprar alrededor de la Navidad, porque puede volverse loco por ahí y no tengo tiempo para pelear por el último juguete en el estante que mi hija realmente quería, ya sabes a lo que me refiero ? Es por eso que me encanta empezar a planificar y hacer una lista de las cosas que tengo que comprar. Establesco un plan de juego con mi esposo en cuanto a lo que los regalos que estamos comprando a nuestros hijos y luego vamos desde allí. Este año planeamos comprar regalos de Navidad ahora mismo, este mes porque así nos ahorramos mucho estrés y dinero. ¿Sabía usted que el punto dólar en Target tiene grandes artículos que pueden hacer un regalo perfecto? ¡Sí! Usted puede comprar algunos artículos y después hacer una cesta de regalo. Estoy segura que usted hará cualquier persona feliz con eso. La tiendo Dollar Tree también tiene un montón de grandes cosas que usted puede comprar por un dólar, como hola! No necesitas gastar mucho dinero en regalos, puede comprar aquí y allá y luego hacer una linda canasta de regalo perfecto para alguien especial en su vida. Déjame decirte que compré unas cuantas decoraciones navideñas de cocina en el Dollar Tree. Usted no tiene que sólo dar la cesta de regalo como un regalo de Navidad, usted puede comprar un artículo grande que su hijo realmente quiere y luego para un regalo adicional, puedes darles una canasta de regalo super divertido pero barato. Comprar regalos de Navidad ahora le ahorrará dinero y estrés. ¿No sería genial si apartar algunos días de este mes para comprar algunos si no todos los regalos de Navidad? No estarás estresandote de que no tienes dinero o que el juguete que querías comprar se vendio en tiendas y por el internet (la peor pesadilla de Navidad de una madre). Comprar en pequeñas cantidades este mes le ayudará a pensar mejor y seguir adelante con su presupuesto, ya que no se apresuran a comprar cualquier cosa. También creo que todo es más caro cuando la víspera de Navidad se está acercando, o es sólo yo? Aquí está una extremidad simple y con todo eficaz al dinero del ahorro mientras que hace compras para los juguetes. No compre el juguete más nuevo y más reciente que salió al mercado porque estara muy caro. En su lugar comprar algo que sus hijos querían la Navidad pasada, pero no podías conseguir, apuesto a que lo encontrarás por menos esta vez. Haga su investigación de qué cosas usted quiere comprar y cerciórese de que tengan los artículos que usted está buscando. ¡Planee qué hora usted va a ir y tener un plan con quienquiera que usted va, divida los artículos y a comprar! Ten cuidado, eso es todo lo que te pido. Bien, esto es más como yo. Me encanta comprar por el internet y si eres como yo, a continuación, aprovechar todas las ofertas de Cyber Monday. Cyber Monday ocurre el lunes siguiente del Día de Acción de Gracias, por lo que escribir en su planificador o establecer una alarma para recordarlepara que compres en la comodidad de su hogar. He encontrado tantos grandes ofertas en ropa para mis niños en Gymboree, crazy 8, Carter’s yChildren’s Placve para nombrar algunos. También puede comprar en Macy’s, Victoria’s secreto y muchas más tiendas por internet. Por favor, tenga un presupuesto de cuánto gastará en compras en línea, ya que puede fácilmente perder la cuenta eh volverse in poco loca comprando. Es adictivo porque usted ve todas estas grandes ventas y usted piensa que es aceptable apenas comprar y comprar. Siempre es una buena idea darte un límite porque no quieres comprar demasiado porque entonces vas a gastar más. Creo en hacer una lista para todo, ya que le ayuda a mantener el foco y en el control de lo que tiene sque comprar y no lo que deseas comprar. Anote su lista de todas las cosas que usted necesita comprar y luego tachala una vez que lo hayas comprado. Siga esto y usted ahorrará el dinero porque usted no está agarrando cualquier cosa en la tienda, usted tiene su lista y el costo de cada artículo. Seguir adelante. Usted tiene que cumplir con su presupuesto si usted desea ahorrar el dinero y no sobre gastar. Esto le ayudará a mantenerse responsable de no gastar más de su presupuesto y centrarse sólo en los elementos que usted necesita comprar. Por supuesto, establecer un presupuesto realista, porque si su presupuesto es demasiado bajo, obviamente, no se adhieren a ella. Siempre recomiendo esto a cualquiera y es tomar efectivo con usted en vez de su tarjeta de crédito. Es mucho más fácil deslizar su tarjeta para comprar algo que pagar con dinero al cajero. Usted puede tomar aún más lejos y solo tomar billetes de cien dólares, vamos a ver cuánto tiempo le tomara para romper su última factura de cien. Siempre pienso dos veces sobre cualquier juguete que estoy comprando porque no quiero romper mi billete de cien, jaja! Me encanta comprar en el estante de venta de tiendas porque se pueden encontrar muchas cosas buenas y bonitas. Echa un vistazo a la señal de venta la próxima vez que vaya de compras, ¿puedes encontrar grandes artículos que harán un gran regalo de Navidad? ¡Apuesto que puedes! También, cuando usted está comprando por el internet, dar le clic a la opción de la “venta” y comience a encontrar muchos artículos bonitos y muy baratos como ropa y zapatos. 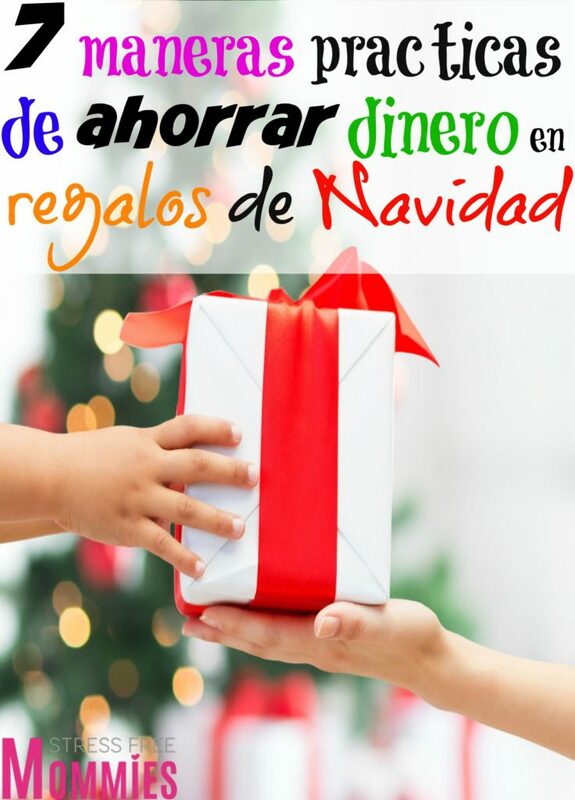 ¿Estás listo para empezar a ahorrar dinero en regalos de Navidad? Sé que yo si y espero que pueda unirse a mí porque todos sabemos lo agitado que se pone durante la temporada navideña, así que empiece temprano y guarde su cordura. Tienes mas consejos para ahorrar en las navidades? Making a list and going on Black Friday are two of my must-dos for sure!! I definitely need to start making a list. And yes I usually like to shop early so that come December, I don’t have a massive bill of gifts. This year I didn’t get to start early and I wish I did! I’ll definitely have to stick to a strict budget this year. Good tips! I use some of them myself. Thanks for sharing at Family Joy Blog Linkup.